If you want my new novel, The Eye That Never Sleeps, and can wait until the release date, May 2, pre-order it now from the publisher, Black Rose Writing, at a 15% discount from the retail price of $18.95; it will ship on May 2. The e-book will be available soon after that date. The more sales I have online, the better. I will sign copies later on request. If you can't wait, buy a signed author's copy from me now at $20.00 + postage. Did you ever have a friend who at times acted like your enemy, or an enemy who at times became your friend? The Eye That Never Sleeps tells the story of just such a friendship. To be released May 2, this is fourth title in my Metropolis series of historical novels set in nineteenth-century New York. Detective Sheldon Minick, one of the two main characters, is already known to readers of my novel Bill Hope, for characters in the series turn up in more than one novel. Summary: Hired by the city’s bankers to track down and apprehend the thief who is plundering their banks, private detective Sheldon Minick develops a friendship with his chief suspect, Nicholas Hale, an elegant young man-about-town who is in every way the sober Methodist detective’s opposite. They agree to a truce and undertake each to show the other the city that he knows and values. Further adventures follow, including a cancan, a gore-splattered slaughterhouse, and a brothel with leap-frogging whores. But when the truce ends, the inevitable finale comes in the dark midnight vaults of a bank. This is not a standard detective story. Sheldon Minick is a bit scared of women, wears elevator heels to add to his height, and loves to belt out Methodist hymns at church (though he leaves the praying to his wife). He is fascinated by Nicholas Hale, who is young, dapper, free-spending -- a risk-taker, deft with women, bisexual. Self-conscious subgroups have always had a lingo of their own, and that has certainly been true of gay people, especially when they constituted an underground society, hidden from the majority straight world but known to the knowing few. Gay men needed their own society and slang, for the straight world – with exceptions – viewed them with scorn and distaste. Or worse still, with pity. Here are some of the straight world’s terms for gay males back in the 1950s, ranging from the least to the most offensive. To which I might add "fruit" and the adjective "fruity," except that today I wouldn't add it at all. Instead, I can imagine a gay kid saying, "Fruit? What's wrong with being soft, ripe, sweet, and good to eat? I'll buy into that, you bet!" The term “camp,” whether a verb, an adjective, or a noun, is of unknown origin, though many origins have been proposed. Be that as it may, it has quite a history. I first knew it in the 1950s as a gay verb, as just noted. By the 1960s it was used more broadly in the meaning of “excessive” or “over the top,” and as such was akin to “theatrical” and “artificial.” It might or might not be pejorative, but often suggested a trendy and “with it” pattern of behavior. Very influential was Susan Sontag’s 1964 article “Notes on Camp” in the Partisan Review. She defined “camp” as “one way of seeing the world as an aesthetic phenomenon,” but went on to call it “failed seriousness,” which some have labeled not “camp” but “campiness,” meaning frivolous and “so bad it’s good.” For some, it was identified not only with artifice and ostentation, but also with naïve middle-class pretentiousness, in which case the trendy became teasingly pejorative. The Gang's All Here, 1950. One example of “camp” cited by Sontag was singer and movie star Carmen Miranda, "The Brazilian Bombshell," whom I recall appearing in old musicals wearing tropical fruits that came off as outrageously and implausibly funny. 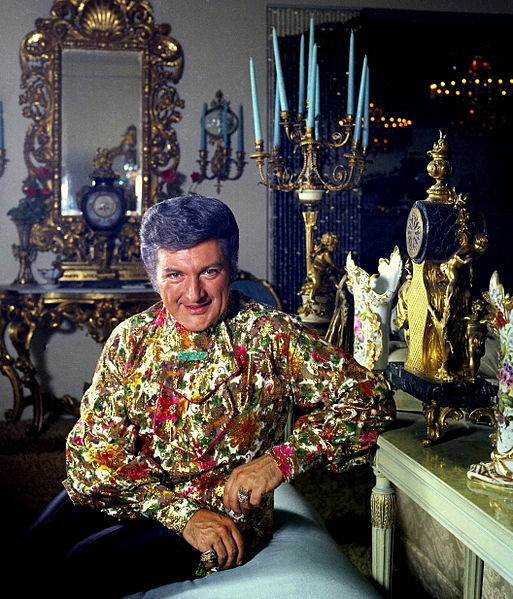 In time, “camp” came to include drag queens and other performers like Dame Edna, Divine, Boy George, and Liberace. And if some of those names don’t register with you, it shows how the concept has morphed over time. “Camp” is ambiguous, elusive. One may well ask if it is frivolous or serious, or a combination of both. Is it a gay term or has it lost that connotation? Is it trendy or hopelessly dated? Ask a dozen historians, and you’ll get a dozen answers. So I’ll leave it to younger generations to use the term as they wish, or to bury it in oblivion. But let’s face it, “camp” has always been fun. For my other books, go here. Coming soon: No idea, but something will happen. 394. Must Gay Sons Hate Their Mothers?